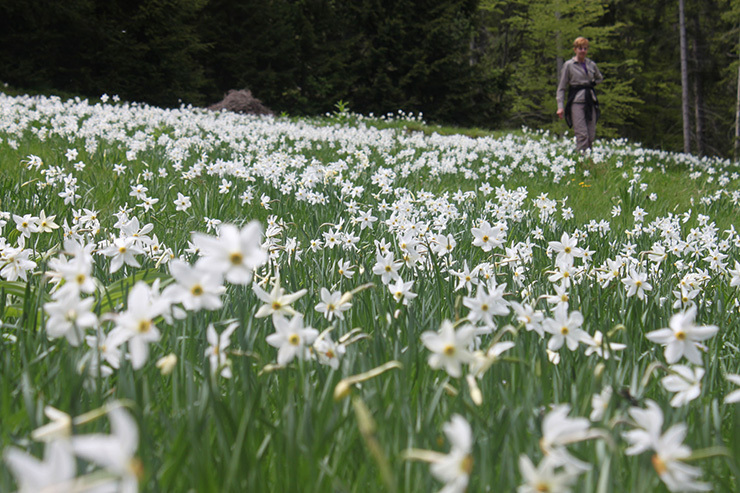 Spring is a magical time in Slovenia. The winters are long and hard in the foothills of the Julian Alps, often with snow on the ground for several months, and temperatures in this part of Europe can plummet to -15 c in January and February. Then the thaw starts and immediately the snow has melted, a small miracle occurs – within days the meadows turn purple with a haze of crocus! Primroses and hepatica cover the banks and birds that have moved away for the winter start to return – the pied wagtails are the first and they love to stand on the roads, we think they’re warming their feet! Then redstarts arrive and suddenly the orchard is alive with birdsong. The redstarts used to try and nest in the hotel while we were renovating it and we had to keep shooing them out.